NEXT STOP GUADELOUPE – see you in 15-20 days!!!!! The trackers live again, with the race starting at 13h (UK time). The course sets us off leaving Fuerteventura to starboard. Then trade wind sailing across to the Caribbean, over 2700nm. Look for Go Ape! Boat 741 in the proto division! I’ve been working towards the Mini Transat now for 3 years. In 2013 I was part of the Artemis Offshore Academy sailing their Pogo 2. Having joined with 1 year to the Transat it was always going to be difficult to get a place in the prestigious race. In order to qualify every skipper needs to complete 1,000 miles of official mini races as well as a 1000 mile non stop passage, of which the logbook is submitted to Classe Mini to be assessed. Once your qualification miles are complete you can then enter the race. I put everything into my 2013 campaign, traveling down to Italy to compete in the earliest races in the season, completing my 2,000 mile qualifications by the beginning of May. Unfortunately it wasn’t soon enough and I joined 13th on the waiting list. Regardless of my place I didn’t give up and kept going as if I had a place on the start line. With document, medical and payment deadlines approaching, there was still a chance I could move up and gain a place, and that I did. By August I was 2nd on the list and things were looking more and more positive. Bringing on board Disc Manufacturing Services (DMS) as a title sponsor for the race, everything was in place. As days moved on, and deadlines passed, it was looking less and less likely I was going to be on the start line. The boat was ready to go, in the next door marina to the race village, food prepped, everything on standby. Motivation went out the window and I started to think of what next…well 2015 of course, and so my dream of being on the start line of the 2015 Transat begun. I started wandering the pontoons, eying up the different boats, finding out costs, working out logistics. My Pogo 2 went back to Artemis and there begun my own campaign and my sole mission was to be on the start in 2015. Budgets, sponsorship, boat details all flying through my head; it was an exciting but hugely frustrating time. Every day watching the tracker of 2013 wishing I was out there, trying to funnel the energy towards my 2015 campaign. The hunt for sponsors to try buy/rent a boat was relentless and some days seemed impossible. Living with parents and on friends sofas, working in bars/restaurants just to keep my head above ground. A full time job was impossible to find. As soon as anyone looked up my name on Google or even asked me a question, it was clear I was planning for the Mini and the race calendar couldn’t accommodate a full time job. Salvation came at the beginning of 2014 when I secured the purchase of Mini 741 a competitive reliable proto while reasonably priced. With a 2 year loan to help fund the remainder of the boat I was set and the 2015 dream came alive. Although the hard work wasn’t over, as most people know, the running costs and maintenance of a boat is the worst bit of it all. I’m quite lucky that I have a small flat which I rent out which brings in enough money for me to be able to eat, so anything on top I can earn goes directly to the boat and campaign costs. With the boat now in Hamble, at the Royal Southern Yacht Club I started working in the King & Queen, renting a room in the village. Working on the boat and my campaign during the day, then in the pub most evenings, life was very busy but manageable. However still with a tight budget I was living on the boat in France and cooking out the back of a car or on the boat which can be tough at times (particularly when it’s raining!). Although the beauty of the Mini fleet, most people are in the same situation and there’s a great community so you’re never alone. I’ve also been lucky enough that various families and people have “adopted” me and invited me to stay in their homes, which is unbelievable. The support and generosity surrounding France and the Mini Transat is truly magical. 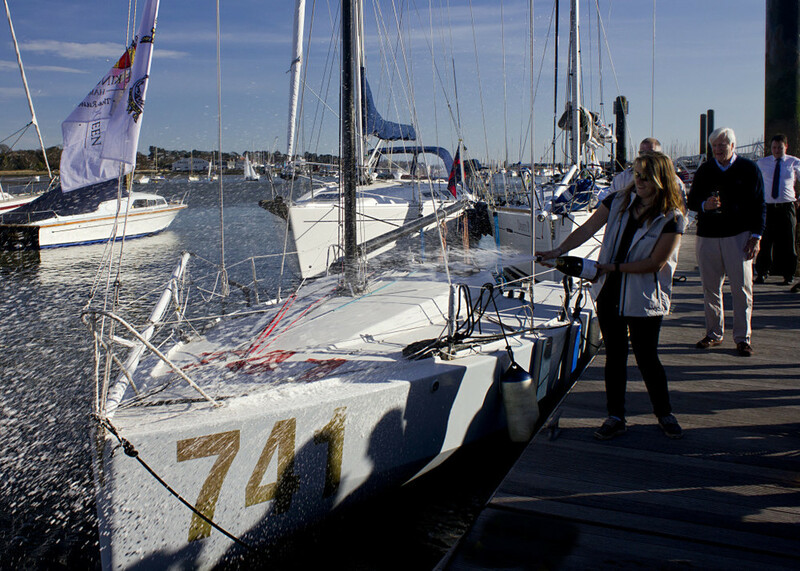 The summer of 2014 bought the Les Sables Azores race, a two leg race starting in the Vendee Globe town of Les Sables d ´Olonne, sailing down to Horta in the Azores, and then back again. A challenging race across the Bay of Biscay, a great test run for Leg 1 of the Transat. After Les Sables Azores I started to make a list of all the systems on the boat, and possible breakages. Making sure I had optimized the system as much as possible to limit breakages, but also knowing a way to fix any problem I could see arise. Over the winter of 2014/15 I moved back to Hamble again, working in The Bugle Pub this time while working on the boat in the day. I changed the whole ballast system, strengthening the joining points to the tanks, changing the transfer tubes to be more flexible, as not to strain the tank joins, as well as adding in an electric pump, to save me spending 20 minutes manually pumping in 200L water. I also completely redid the electrics onboard, building a new fuse panel with circuit breakers, replacing all wiring and double checking every device. I also changed my standard batteries to Victron Lithium batteries, installed a Victron battery monitor and solar regulator. Later in the year I also installed a new Autopilot, a more responsive and powerful ram yet still power efficient. Before I was using an on deck tiller pilot, which certainly does the job, but isn’t ideal when you have to clip it on and off every time you use it. Always striving for more I continued to work, aiming for some new sails, a week in a bed and not on the boat before the start, healthy food and not just pasta pasta pasta! I headed back to the UK for a delivery job, and Cowes Week to work as First Mate with Sailing Logic / Britannia Events. Picking up any work where I could, but still leaving time to work on the boat and prepare for the race. After Cowes Week, it was straight back to France and boat work, antifouling, recoating the mast and boom, replacing more ropes, servicing all mechanics and checking everything over. Typically time never quite works out in your favor and delays held me back a bit, but everything’s always ok in the end and the boat and I was ready to go! Problems seem to come in threes and this time they really did, a weeks delay with technical issues with the antifoul spray job, my van decided to die on possibly my busiest day, and my ballast snorkel needing resealing to the hull days before I was due to launch. Everything worked out, with a bit of extra time and effort, and a massive thank you to the loan of a car from a great friend. The night before the race “Team Nikki” enjoyed a meal together; having everyone in the same place before I headed off was truly a special occasion, it doesn’t happen very often in my family – as we’re always off in different places. My older sister had even flown in from Australia. I’ve decided I’ll have to do this all over again just to make it happen again!! Fully immersed into Bretagne life now, Sunday morning’s breakfast was the “Boreal crepe challenge.” Is it possible to cook a pancake on a Mini? In short the answer is yes, but next time I’ll definitely be more prepared. Pre made mixture in a bottle and my little frying pan for the jet boil all was looking good. Heating up the pan nicely and then turning the heat down I was focusing hard on not letting the pan get too hot (very easy to do with a jet boil). With the new simmer feature thankfully this wasn’t a problem. However forgetting oil to grease the pan was a massive downfall, as when it came time to flip, the whole thing was completely stuck to the pan – doh!! Regardless of the situation I did what I could to rescue what was in the pan, and enjoy my “pancake” with one of Rolly’s brownies, a great start to the morning. Now back to drifting. At 10 UTC everyday we had our SSB bulletin with a brief weather forecast and our ranking and distance to finish. In order to pick up the signal I’d had to create an antenna which was taped to the rigging. The antenna is made from solid core coax, with a 3.5 jack fitting on the end which can attach to the radio. There was a lot of debate among all the different skippers for the best methods, lengths and materials. Unfortunately you can’t really test the antenna on land as there is too much interference so it’s very much fingers crossed once you get out. Day 1 came and I didn’t hold much hope as we were still very close to land. I tuned in and could hear a very faint signal of something, but nothing understandable. I had a spare antenna so I quickly hoisted it up the mast using a spare halyard, just in case it was any better – no luck…tomorrow’s another day! The wind filled in, genneker up we were heading off at 5/6 knots. Wind very up and down; I really had to change the set up, ballast in-out-in-out trying to find the best set up. The wind started to die into the night, then build again in the early hours. Passed the front – yahoooooo! The decision when to tack across was vital to the route, and something I definitely was too late on and lost a lot of ground sailing as far west as I could. I tacked over in the middle of the night, the wind now quite strong, after the tack I ran onto the deck to check the rig, not quite straight, a big bannna belly in the middle. Ok tack back, tighten the right. I then waited till the morning light to tack back and have a thorough check. Best to be safe at this point, it´s still early days. Morning came and everything was ok, wind was building and freeing up. The kite went up and I was up storming along, surfing the waves. It soon became very gusty and was becoming very sketchy with the kite, I had a knock down which I couldn’t bounce up from. I went to drop the kite, tack line round the winch, trying to blow the clutch. A big gust knocked me further over and I fell down across the cockpit into the leeward guardrails. Head under water I scrambled around trying to find a stantion to grab and get a foot on. Adrenaline pumping, thank god for safety lines I knew I wasn’t going anywhere, but still eager to get back into the boat. I pulled myself up the boat with the tack line in my hand. I got the kite down, and then just lay on top of the bag for a few minutes, reliving what just happened. Pheeeewww, that was close. By Tuesday afternoon I was passing Finisterre, the wind had dropped, but the waves were still very choppy. Waypoint in the GPS now Lanzarote, 10 degrees off course, some 800 miles to go….Awesome! Wednesday morning I saw my last mini, as we crossed paths on different gybes. “Nikki Nikki Nikki, is that you with the Orange spinnaker – yes yes yes that’s me, are you with the red kite? Little did I know that this would be my last conversation with a mini´ist until Lanzarote. Strangely it was quite a nice thought to have, I really quite enjoy being alone at sea, and with everyone still in sight at Finisterre I was keen to get going and get on with MY race and loose touch with everyone else. The Mini Transat starts today, September 19, 2015. 19th September in Douarnenez, 74 competitors, 16 different nationalities, of which there are only 4 girls. I’ve been working towards the Mini Transat for 3 years now, having narrowly missed out in 2013, being 2nd on the waiting list. 3 years seems like a long time but WOW how time has flied with only 3 weeks until the race village opens. I feel prepared and on top of everything, I’m almost getting stressed about not being stressed! Saying that, waking up this morning knowing we only have one month left is quite daunting, and the to do list is still quite long – 31 days sounds much better right?! I’ve just got back from a couple weeks in England, which included working for Sailing Logic during Cowes Week. Sailing and teaching Sailing Logic Individuals, as well as corporate guests through Britannia Events. I thoroughly enjoyed the week, and re discovered my love of teaching and getting involved with a fully crewed boat. Fully crewed hasn’t won me over yet though, I still much prefer the challenge and enjoyment of solo sailing! Having been away from the boat and Transat preparations I’m now madly getting the boat ready, my life has become spreadsheets and to do lists, which seems to be never ending. Boreal’s coming out the water tomorrow, and the mast coming out. For a fresh antifoul paint job, and a thorough check over the rigging.